The earlier editions of Ivy Leaf list men who received various awards and medals. 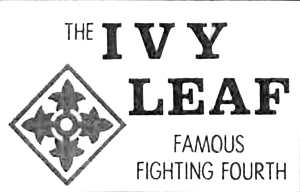 Ivy Leaf was the Division newspaper until 1969 when its name changed briefly to "Steadfast and Loyal". The headline for each paper is listed in bold. Those with a story about the Red Warriors or one or more men serving in the Red Warriors are identified with a **. All stories listed under the bolded headline refer to the 1/12. Most newspapers were retrieved from the 35th Infantry Regiment Association Collection, The Vietnam Center and Archive, Texas Tech University. Lt. Col. Wilcox New Commander of "Rad Warriors"
Lt. Col. Wright Assumes Command of "Warriors"
Young SGT Finds Job "Lonely & Frightening"
SP4 Says "This Is the Life!" Enari Turned Over to ARVN Reg.